This report presents detailed definitions of performance figures for: 1. The components, for the component tests which may also be used for system evaluations e.g. by the Component Test System Simulation (CTSS) method; 2. 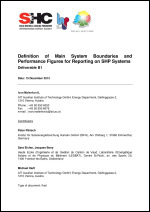 The whole system and its subsystems, for the system analysis and optimisation, as well as for comparison of SHP systems among each other (including quality assurance – performance reporting), using e.g. monitoring results or whole system test (WST) results; 3. The whole system, for comparison of SHP systems to other systems in terms of e.g. energy efficiency, primary energy efficiency, and emissions. Within the T44A38 as many as 13 different system tests could be performed successfully. 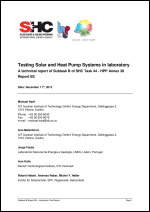 Three different test methods were conducted, a modified bin method, a test based on EN255-3 and five tests according to the concise cycle test (CCT). The test with the modified bin method and the test based on EN255-3 were conducted on the same system. The comparison of the two test methods showed a good agreement in the results, although the boundary conditions were slightly different. The test based on EN255-3 was more time consuming and depending on the weather conditions. Therefore the test seems also not to be repeatable with the same conditions. The modified bin method, which is based on a Trnsys simulation model, needs only to perform some specific experiments for parameter identification. The whole system test method CCT proved to be a valuable tool both for system development as well as for performance evaluation. The advantage of this kind of system test is that non-ideal component interactions and the influence of hydraulics and control under transient operating conditions can be detected and evaluated precisely. The test delivers within 12 days information about all operating conditions that may occur during a whole year and is thus much faster than field testing.